Watching a dog gracefully jump is a beautiful thing, and most dogs seem to love it. Dog jumps can be made out of almost anything, from a broomstick set on two buckets to a hay bale. There are all sorts of fun things your dog can jump over. You can even build a special jump. Before you get started, there are a few things to remember. First, don’t encourage your dog to jump over fences because you will probably regret it. When teaching your dog to jump, start with the jump very low and work up slowly. You wouldn’t want her to get hurt. Don’t ask young dogs to jump higher than a few inches until they are at least 1 year old. In fact, it’s best to wait until they are 11⁄2 years old before going to full height. How high is full height? It depends on your dog. Your best bet is to ask your dog to jump something that is only as high as she is tall in other words, nothing higher than the top of her shoulders. Also consider your dog’s shape. Dogs with long backs and short legs, such as Dachshunds, Basset Hounds, and Corgis, are more likely to have trouble jumping. Overweight and older dogs also should not be asked to jump very high. Others may not want to jump at all. Respect your dog’s wishes. Start by creating a jump—a pole or a broomstick is ﬁne—and set it on the ground. Lure your dog over the jump and reinforce her with a treat. When she’s done this a few times, introduce your jump cue—”over” and “jump” are two possibilities. After a few repetitions, you can try giving your dog just the cue, and then wait until she goes over. When she does, click and treat. Repeat several times. As she gets more conﬁdent, you can slowly increase the height of the jump. Do this very gradually—just a few inches at a time. With an adult dog who is in good condition, you can probably add about two inches a week. If your dog looks at a jump and refuses to go over because it is too high, lower the jump height and work on that for a while until you are sure she is ready to go on. Most dogs refuse to jump not because they are lazy, but because they aren’t sure they can jump that height without hurting themselves. Never force your dog to jump over something she doesn’t think she can jump. Once your dog knows how to jump on cue, you can work on a jumping routine. Put several jumps in a row, or try ﬁgure-8s and circles. Just be sure to give her enough space to land safely between jumps. 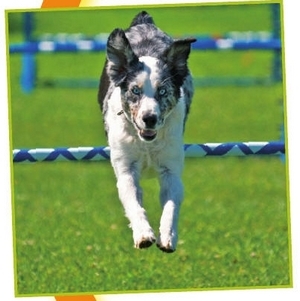 Jumping over and through things is part of a canine sport called agility. 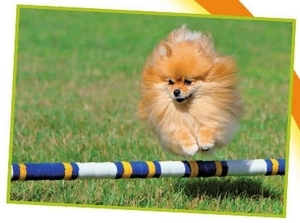 Agility dogs also go through tunnels, weave between poles, and walk on seesaws and other equipment. If you have seen agility on television or in real life and think it’s something you and your dog would like to get involved in, look up a local dog club and see about joining a beginner class. This way you can learn from an experienced instructor who can work with you and your dog on equipment that is safe and stable. Don’t try to reproduce what you see on TV unless you are absolutely sure that what you are asking your dog to do is safe and fair.